Do you have a special car that you bought that you only use to go out and buy broccoli? Do you have a special refrigerator at home only for the purpose of cooling the broccoli? Of course you don’t. That’s because any old car can carry broccoli and you can put it in the fridge with the tomatoes; they don’t care. It is with some hesitation that I bring this up, but do you have a screwdriver specially made to adjust the screws on your bronze plane? And do you have a special little bag to carry your plane around in when you take it on vacation? It’s okay if you answered yes to these last two questions. On the upside, you are helping the economy and showing your support of the arts, in a way. A special screwdriver for your plane is a broccoli car. The downside is that you have failed to resist the marketing barrage aimed at craftspeople, especially ones new to the field. This is understandable, because it does seem foolish to spend a lot of money on a plane and then risk having it spend its life unprotected by a bag. It is from experience that I can point out that if you drop your plane on the granite front step, it will break in half right inside the bag. This is handy because at least you know where all the pieces are. My point is this: resist. Resist buying more stuff. Resist the special gauges to measure your dovetail angles, resist the special brushes to brush off your bench. 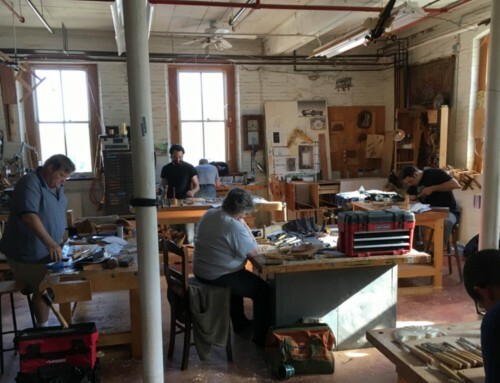 Neither your bench nor your dovetails will thank you. 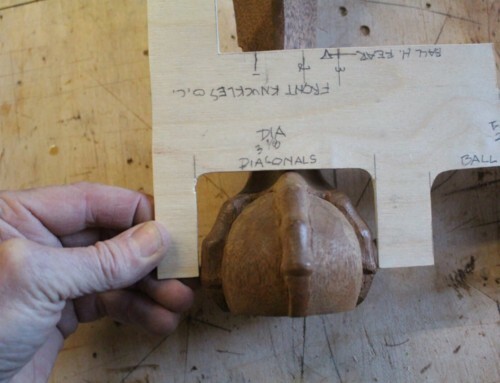 You can eyeball your dovetail angles and they may vary by two degrees. 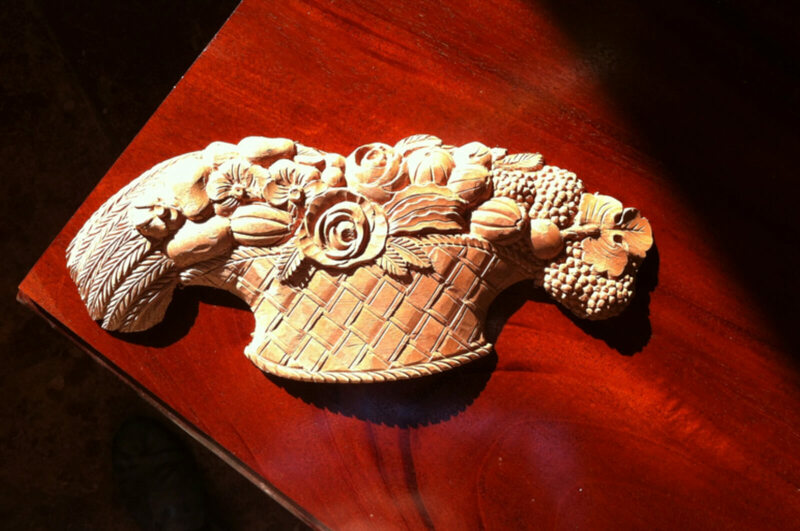 This is called hand made. 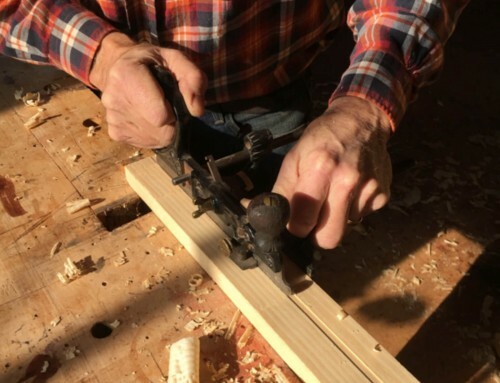 What really matters is how close you cut to your pencil lines, and there is nothing they can sell you aside from a dovetail jig that will assure perfection. 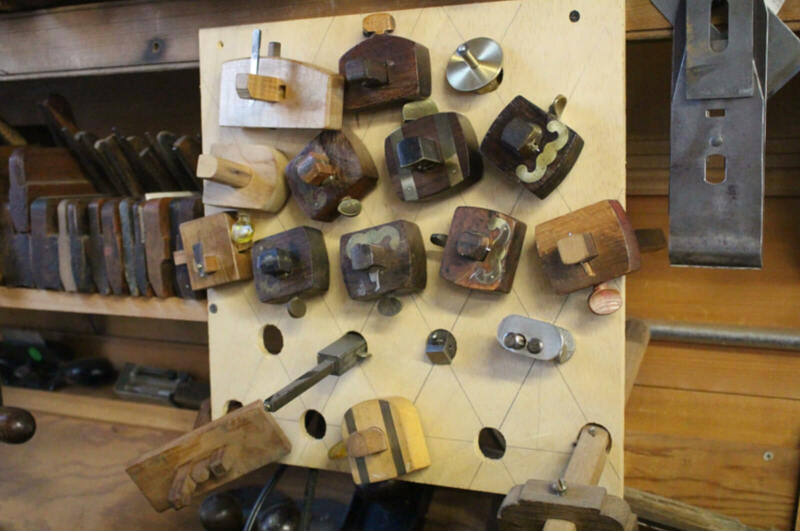 I think unused dovetail jigs are second only to exercise equipment in the buyers’ remorse department, so maybe even the jig won’t make it perfect. Sadly, the solution to the broccoli car problem is not quick, but it is simple. The solution is education and experience. If you have a bunch of money sitting around the house that could cause you to trip and fall, by all means give in and buy a lot of stuff you may someday need, and then get some education too. If that’s not your problem, spend the money on education and skip all the stuff. It is an enormous benefit to have someone with experience tell you things. Life is short, and there are some simple things that you may never figure out by yourself, so hire someone to tell them to you. As a logical conclusion to the above lecture, I am going to let you in on some terribly kept secrets that I have learned. These are things that I use every day in making furniture by hand and encourage anyone who will listen to acquire. 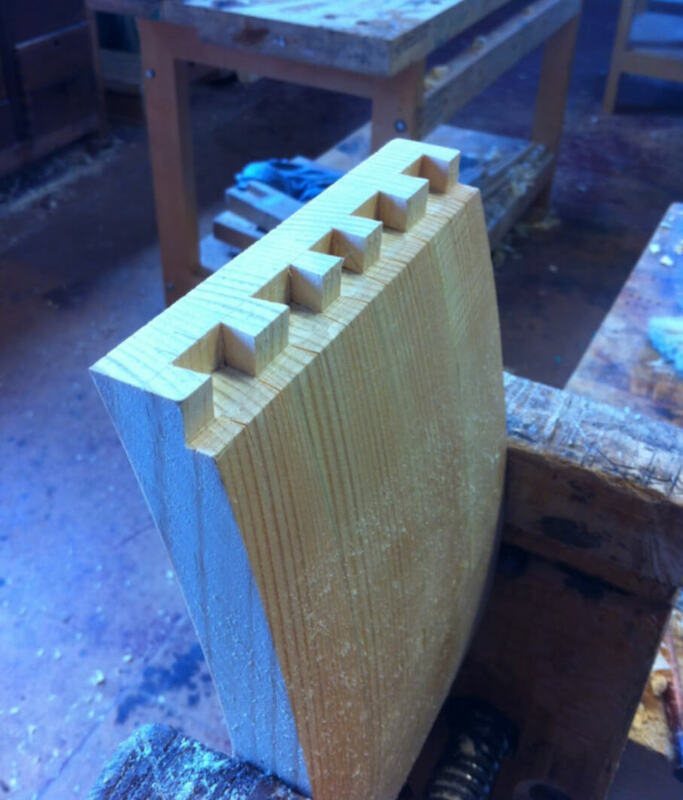 Bevel edge paring chisels are a good all around choice because you can make mortises with them as well as dovetails. 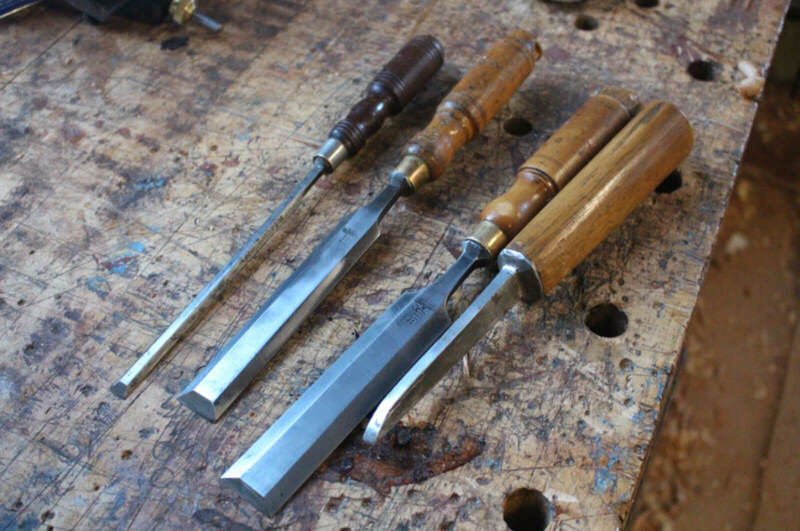 I use them all the time for most of my chisel work. The chisel on the right is a mortising chisel, 5/16”. Nearly all furniture mortises are this size. If you don’t have a mortising machine you can drill holes and chisel the waste out with this and one of the bevel edge chisels. 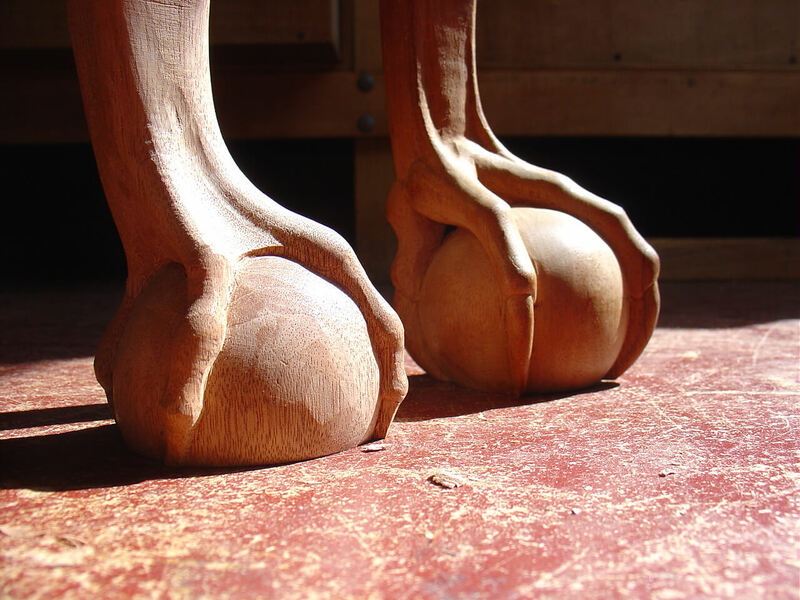 You need these to do shaping on cabriole legs, chair crests and splats and carving. They get rid of bandsaw marks and will smooth a surface to the point that a scraper will be all you need to follow with. The top one is an antique rosewood model, the middle one an antique Marples and the bottom one a new Woodjoy model, which I like a lot. The small ones I use at the transition between feet and legs and the tops of pad feet. A good shave must have no chatter in the blade and a very low bevel angle. I have none with flat soles, only rounded. A no. 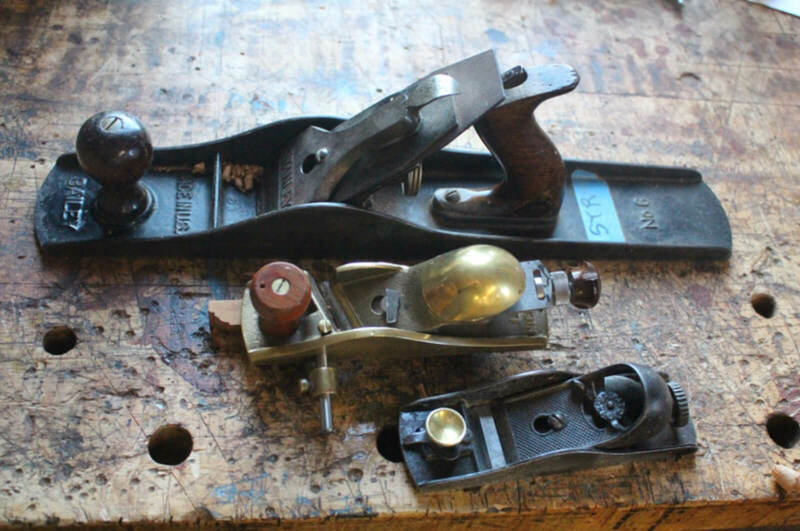 6 iron bench plane, a Lie-Nielsen side rabbet block plane and an old Stanley low angle block plane. For general smoothing the no. 6 is my favorite. I admit to having about 4 of these, they’re so cheap, and I have them ground differently. The one shown here has a straight across blade for doing edge joints. 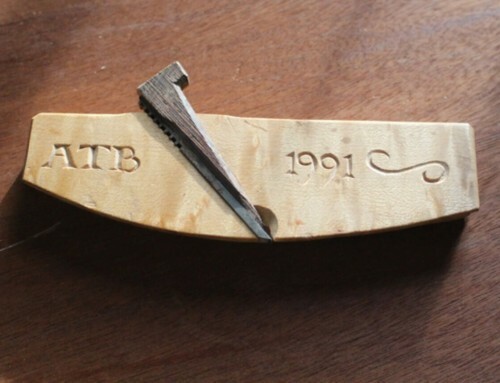 I have one with a more rounded grind and one with the frog moved way up to do very fine work on figured wood. This plane will do the work of many “specialty” planes except maybe a super low angle plane for end grain, which I rarely need anyway. To avoid the broccoli car effect you can have one plane with several blades. 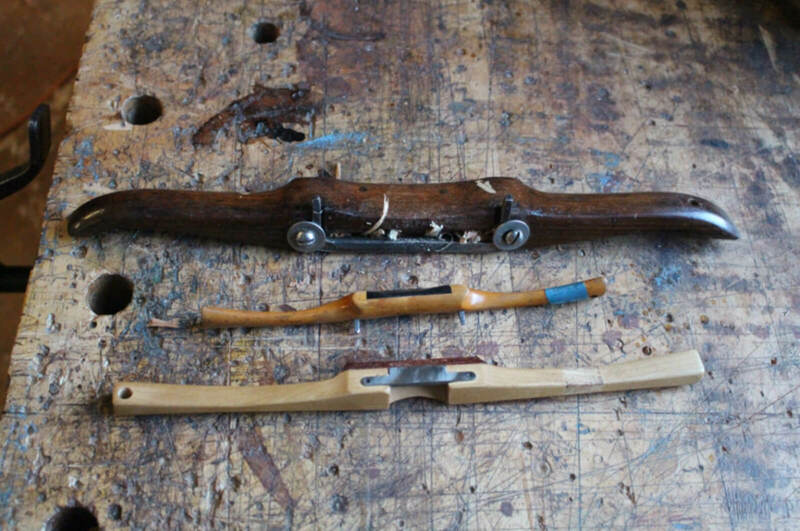 The middle plane is an early LN model that I use almost exclusively for cleaning up tenons. The bottom one is used constantly for fitting and shaving, cleaning up joints and leg knees, etc. Buy every antique one you can find. They are better than new ones but they do break when dropped on a hard surface. The knurled wheel adjuster is the best, I think. Although this may look like a broccoli car parking lot, there is really no all purpose marking gauge. Some of these are for cutting, some for marking and one for cutting grooves for inlay. The fact is that I may have several set up, each for a specific measurement, on one job. In making chairs especially, there may be two or more mortise settings. In theory you could reset the gauge for each use, but returning to the previous setting exactly is quite tricky, so it’s better just to set one up and leave it that way til the job is done. 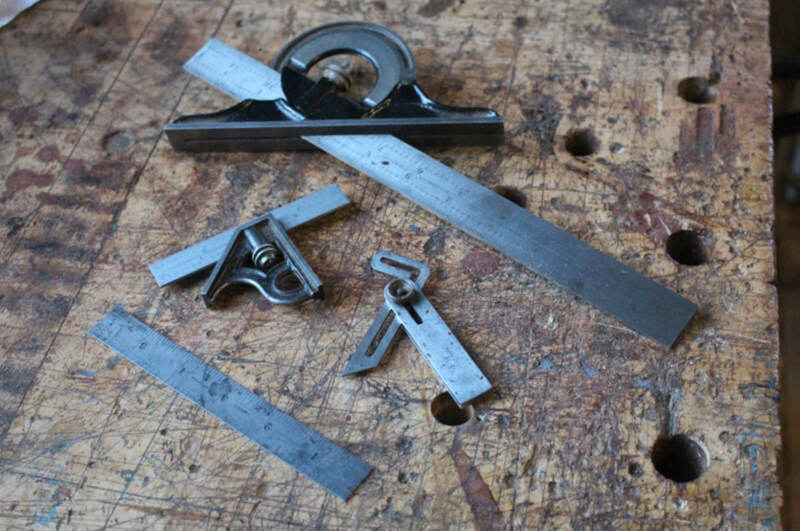 A Starret bevel gauge, a 4” try square, a small bevel gauge and a Starret 6” rule. I left out the 12” try square, assuming everyone has one. The 12” bevel gauge I bought for chairmaking and have used it ever since. Get the one where the rule goes right down the middle of the body, not on one side. You can set your table saw angle with it by taking the throat plate out of the saw, cranking it down all the way and putting the gauge across the throat. Also good for chairs with left and right parts as it works on both sides since the blade goes down the middle. The 4”try square is very handy for chairmaking and other small work. The small bevel square is just a small version of the Starret and used where the big one won’t fit. Lastly, a 6” rule is the last word on exact measurements like setting up mortising gauges and depths. This is a portion of the scrapers I have ground for specific purposes over the years. 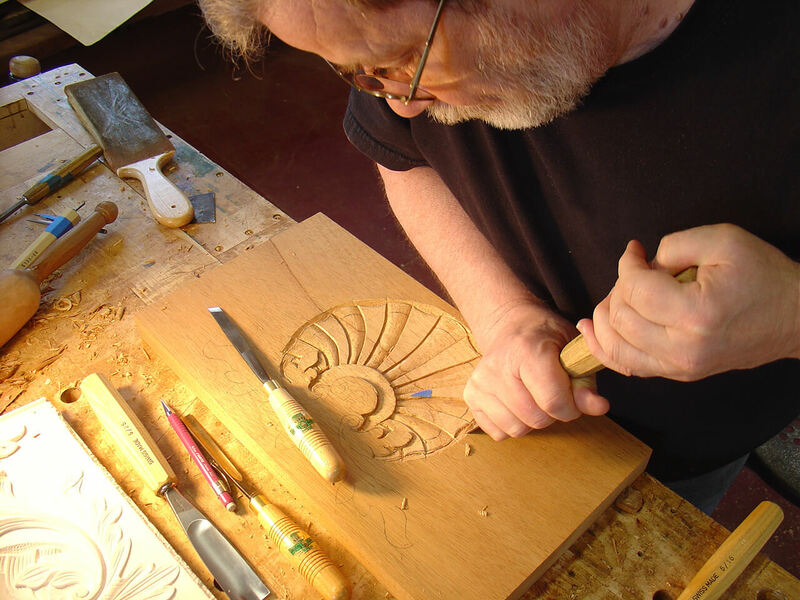 Scrapers are easy to make and are a really good way to make curved moldings after the major work has been done with carving tools. Some are only ground on the wheel, some are filed and some are filed, stoned and then a burr put on if the work needs to be really smooth. Some of these are made from saw blades and the rest from regular commercial card scrapers. Thicker is not better in this case. A medium to thin gauge steel is the best. Some of these I freehand and some will go in a scratch stock to fence them. 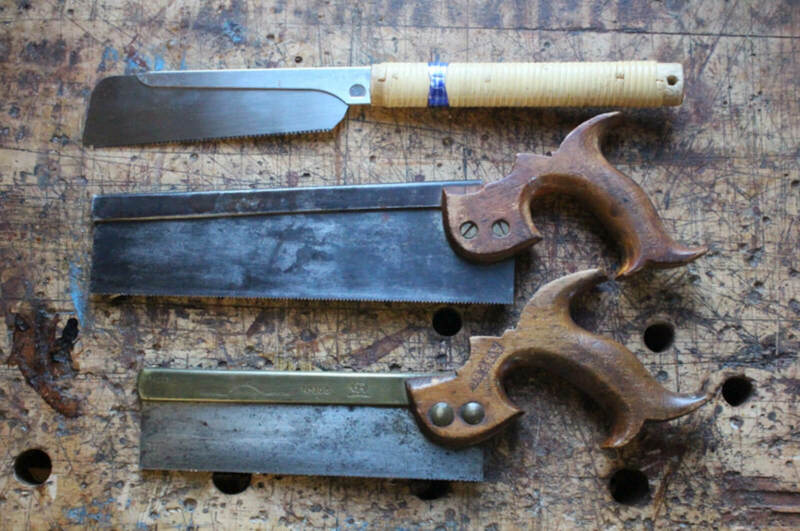 A Japanese saw, a general dovetailing saw and a finer one for small work. Not shown: panel saws, a rip and a crosscut. The Japanese saw is pretty versatile for small fine work. I use it to cut the shoulders at the either end of a run of dovetails, but not to cut the pins or tails because it doesn’t steer well- it’s too good at tracking straight. The other two are ground rip for dovetailing. I hardly ever use a crosscut backsaw because I make most of my tenon shoulders on the dado blade. I do use one for cutting the shoulders at the top of a chair stile where it joins the crest rail. 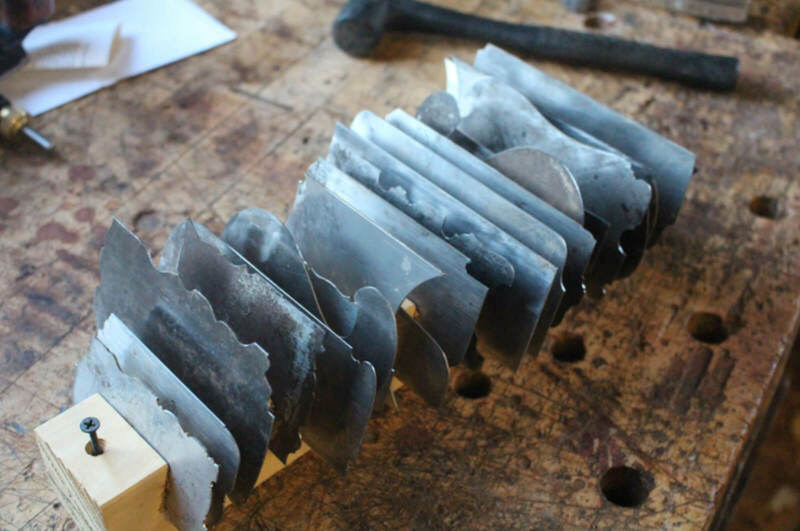 If you get only one dovetail saw, which I would suggest,(even though I have a wall full of these things accumulated over the years, I only use one or two ) get a fairly coarse one. You can make dovetails just as slick with a coarser saw unless you’re always working with very thin stock, maybe ¼” or less. It’s also faster to cut with fewer teeth. The moral of the story is that you can do a lot without a lot of fancy tools. Buy what you need only when you need it. There is no such thing as a starter set because it all depends on what you’re starting. Work on your education. You won’t regret it. More information will allow you to decide what you do need to complete a project. And avoid the broccoli car. You’ll be surprised at what you can do without! Learn the best methods and tools needed to efficiently create these striking feet in 3 iconic colonial styles.